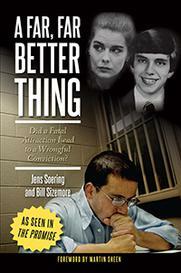 A retired FBI agent has come forward to join three seasoned law enforcement officers in calling for the release of Jens Soering, a former UVA honors student convicted more than 30 years ago for the murders of his girlfriend’s parents. This latest announcement is based on new evidence of a psychological profile that pointed clearly to the couple’s daughter, Elizabeth Haysom, as the most likely killer. When sheriff’s deputies found the bodies of Derek and Nancy Haysom in their Bedford County home, they were appalled. Both victims had been stabbed many times, and there was blood everywhere. They contacted the FBI, which sent an expert to profile the likely killer. That agent’s name was Ed Sulzbach. “Prior to his passing he was interviewed, and he confirmed that he had done a profile,” says Stan Lapekas, an FBI agent for more than 25 years. Lapekas asked for a copy of that profile as did RadioIQ, but the FBI said it did not have that document. Lapekas went further, asking for a file on the case. The original Bedford County investigator, Chuck Reid, also insisted there was a profile, but he left the sheriff’s office soon after the crime, and a rooky detective named Ricky Gardner took over. He told us there was no profile and became angry when a German film crew pressed him on the point. He left the room, slamming the door behind him. The profile is important, because Ed Sulzbach thought Elizabeth Haysom, the couple’s daughter, was responsible for the murders. She blamed Soering, and both are behind bars. Sulzbach also examined a bloody sock print that would prove key to Soering’s conviction. “He had provided measurements of the footprint, and he determined that it was probably attributed to a female, and that the person responsible for the crime was close to the family,” Lapekas says. A tire track expert was called to the stand during Soering’s trial. The judge refused to certify him as a footprint expert but allowed his testimony. He overlaid a print of Soering’s foot with a photo of the blood sock print and told the jury it fit like a glove, but retired FBI agent Lapekas disagrees. “The footprint that was presented in court to the jury by the non-expert witness through an overlay in my opinion is nothing more than a magic trick that was purchased at a five and ten store. It just doesn't meet any relative standard at all,” the former G-man concludes. Now, Lapekas is joining Albemarle County Sheriff Chip Harding, original investigator Chuck Reid and long-time Charlottesville detective Richard Hudson in calling on the governor to pardon Soering. Harding points to new DNA evidence showing two unidentified men were at the crime scene, while none of Soering’s DNA was found, and he argues a pardon is long overdue. “I talked to the pardon investigator last May, and she said she had hoped to get to the case in September of 2017, and here we are in April of 2018, and we haven't heard anything," says Harding, frustration evident in his voice. He thinks this state needs to make it easier for people like Soering to have their case reviewed. "Mary Sue Terry said in 1993 when she was attorney general that once you’re convicted by a jury in Virginia, your innocence is no longer relevant!" Harding says. 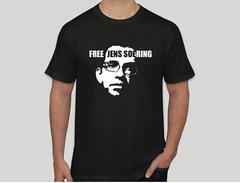 He adds that Soering is not alone – that between one and ten percent of criminal cases may involve wrongful convictions. That means as many as 200,000 Americans could be jailed for crimes they did not commit.